“It is with great sadness that we announce the death of Rollo Geoffrey Woods, who died today, January 29 2018, at the age of 92. There will be a thanksgiving service in Swanage URC at 1200 on Friday 9 February, with a further celebratory event on April 7 from 3pm at Swanage School. All who knew him are warmly invited to attend one or both of these events. To put into words his achievements would take more space and time than we have, but I shall try. Much of his personal life was devoted to the folk arts. His grandparents were keen revivalist folk singers and his mother was a dancer – it was she who first introduced him to English Country Dancing in 1937 at the age of 12. 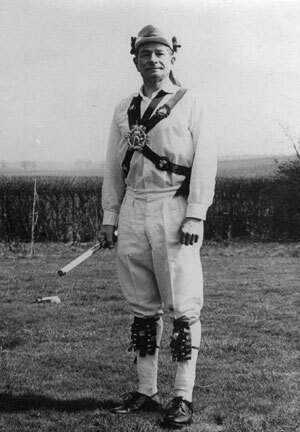 He was Squire of the Cambridge Morris Men and later the Winchester Morris Men. 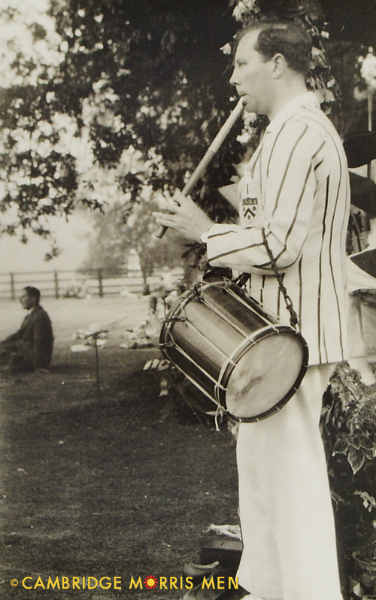 He took up the English concertina in 1948 and played with William Kimber, Scan Tester, Stephen Baldwin and Bob Cann. He also contributed much of the music for Lionel Bacon’s seminal “Handbook of Morris Dancing”, known to all as the Black Book. He played for ceilidhs for longer than some have been alive, over 60 years. He founded the first ceilidh band in Hampshire, the Black Glove Band, ran the Greenwood Tree in Swanage for 20 years and his last band, Maiden Oak is still going today. His arrangements and sets are legion and legendary, becoming common currency in the region and survive as battered photocopies all over the country! For many, Rollo will be remembered as a researcher. He started researching West Gallery Music in 1972 after a chance discovery of manuscripts in Widdicombe in the Moor in Devon and it gradually became a consuming passion. He founded the Madding Crowd in 1975, the Purbeck Village Quire in 1989 and was a founder member of the West Gallery Music Association in 1990. He has published several books on the subject, his last, the second edition of “Good Singing Still”, being released only last year. 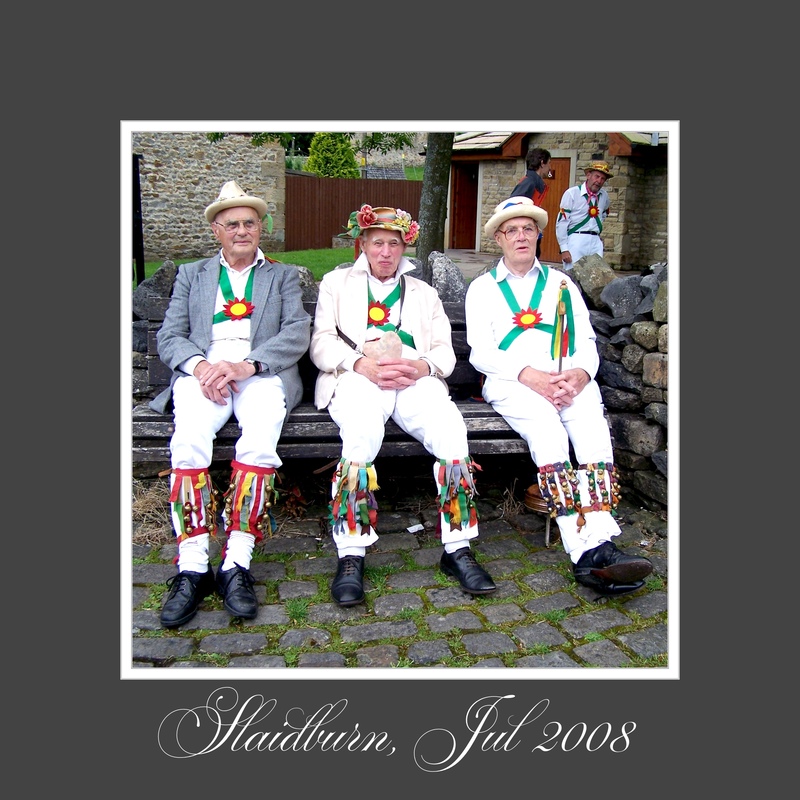 In 2015 he was awarded the gold badge of the English Folk Dance and Song Society for a lifetime of work promoting the folk arts. That is how posterity will remember him, but to those who met him he will be remembered as someone who took an interest, who worked tirelessly on behalf of others and one whose dry humour was never far away. 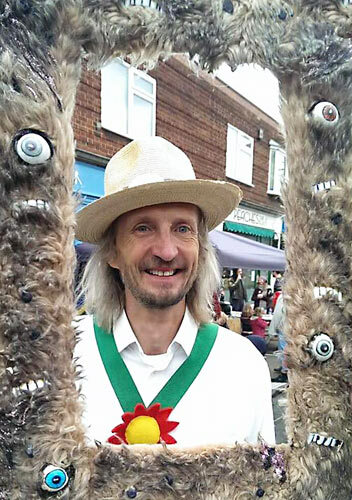 He led dance workshops with EFDSS, ran the children’s band at the Avon Tyrell residential weekend and ran evening classes for Hampshire County Council’s Further Education department for over 15 years. He would construct all sorts of instruments out of odds and ends for these groups and it was he who gave many children their first experience of playing music, myself included. This was a source of great pride to him in later life. On a personal note, it is because of him that I have had such a huge amount of pleasure in playing traditional music and playing the melodeon. Saturday December 2016. 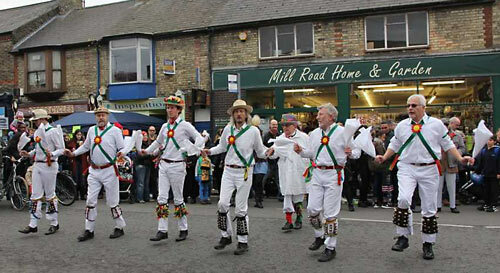 It’s the day of that fabulous day-long street party, Mill Road Winter Fair. Will it be freezing? Who cares, it’s always a great day. Mill Road is choc-a-bloc from East Road down to Coleridge, virtually every shop has stall out with everything Cambridge’s most multi-cultural street can offer. 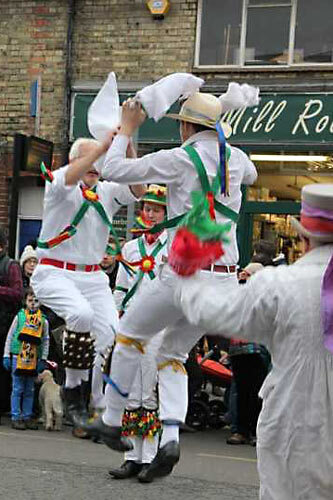 And there’s loads of street entertainment including the Cambridge Morris Men (just don’t put us next to the Samba Band pleeeease!). We had a great day, as I hope these pictures show. Thanks to the dancers and to all friends who came up to say hello. 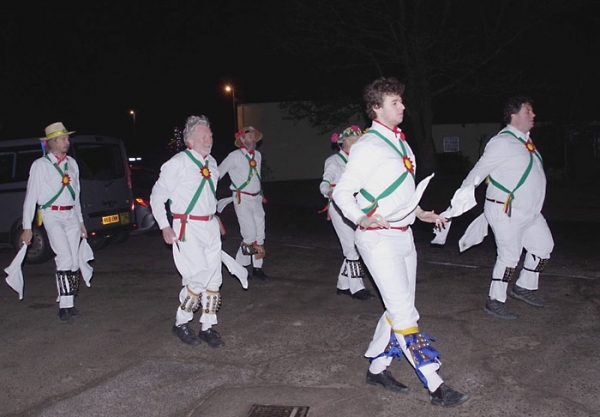 Elected and Honorary Cambridge Morris Men at the event: Graham Cox, John Weaver, Matt Simons, Ollie Simons, Randolf Scott, Mike Garland, Adam Garland, Peter Halfpenney (not dancing but stood to sing a song), Jon Melville, Charlie Corcoran, Joe Oldaker, Roger Comley, Mike Wilkinson and Ian Phillips. And elected CMM musician: Liz Bassett. It was a great evening. 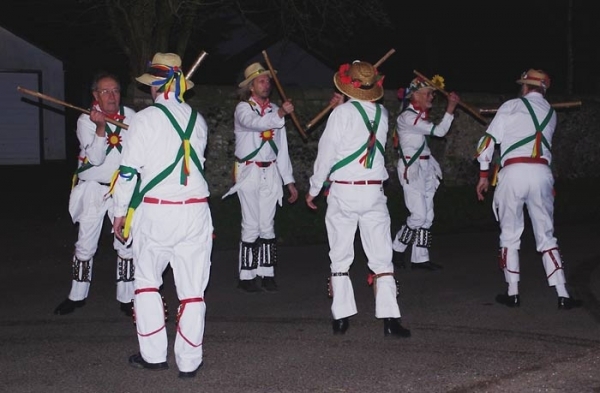 At one stage the younger members of CMM, Anker MM, Jockey MM and ESMM (no doubt with others) performed a nine-man version of the Quaker, Bampton. Much later Matt and Ollie were two of the three who performed correct Bucknell double capers in Saturday Night. 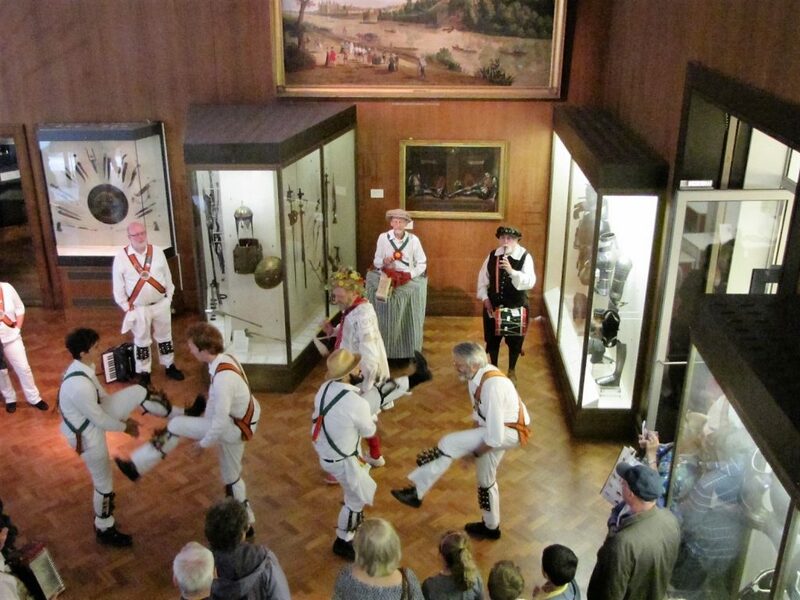 Helen Strudwick of Devil’s Dyke MM and The Fitzwilliam Museum arranged for a combined show of DDMM and CMM in front of an early 17th century painting showing a Morris side dancing beside the Thames opposite Richmond Castle. The painting had been in Lord Fitzwilliam’s collection, donated to Cambridge University 200 years ago as the foundation of the museum. Five Cambridge men as well as six honorary members wearing other kit traveled to London city centre on the second roasting hot day this year to dance with men from eleven sides including Thaxted, St. Albans, Anker, Jockey, North British and our hosts, the Westminster Morris Men. We danced near Westminster Abbey, the houses of parliament, some excellent old pubs and the Thames. Both the morning and afternoon tours ended up with massed shows in Trafalgar Square. Thanks to Dave Brewster, Danny Gallagher, Emma and Jon Melville for providing us with fine, uplifting music. We are sorry to announce that Kay died following a long illness. 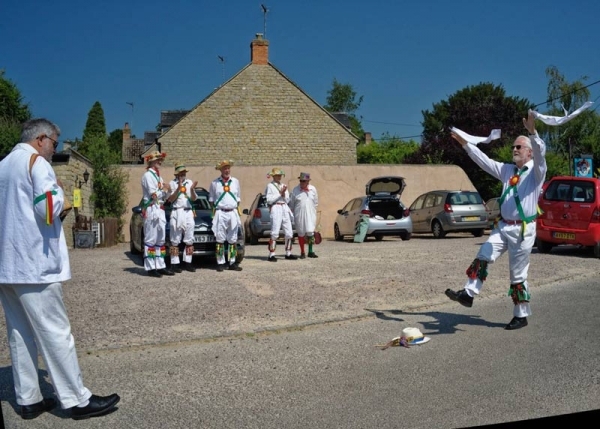 He will be sorely missed as a kind companion, an lively conversationalist and a fine dancer. Kay was a stalwart of the Travelling Morrice, organising many tours. “Ike” Eickhoff, Prof. Norman Peacock and “Kay” Reynolds met at Sidney Sussex college in 1941 while sitting the scholarship examination for Natural Sciences. Kay Reynolds on the 2008 Travelling Morrice tour to the Forest of Bowland, waiting to bring on the sword cake. 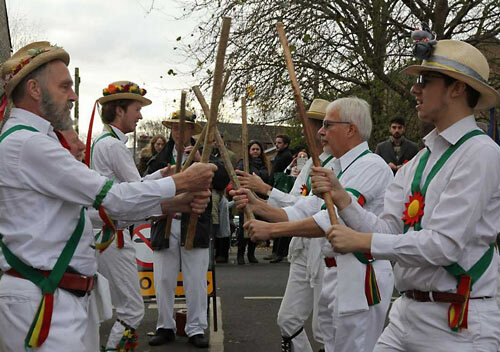 Despite a cold, wet day over most of East Anglia we enjoyed fine weather and the excellent dancing of sixty visiting sides from The Morris Federation, The Morris Ring and Open Morris. 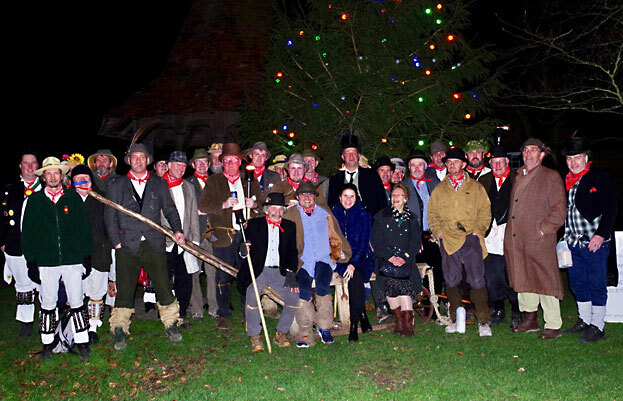 Many brilliant photographs were taken and links or actual pictures will be posted here very soon. In Cambridge on Saturday 10th May 2014 from 10 a.m. to 5 p.m.
How do we get to be part of this event? Will your side be staying in Cambridge for Saturday evening? 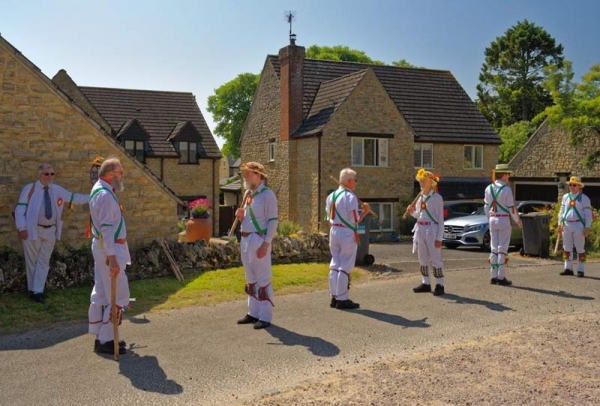 Places will be allocated in proportion 55% – 25% – 20% so there will be room for 33 Federation sides, 15 Morris Ring sides and 12 Open Morris sides. 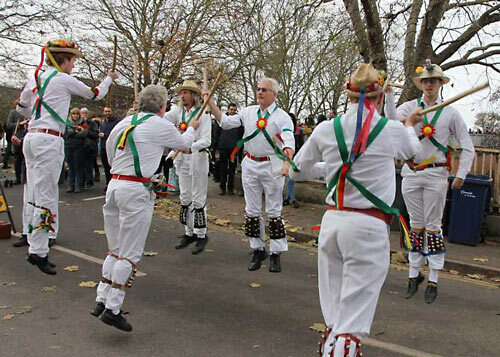 Dancing in Cambridge during the day at a number of dance spots within walking distance. All get together briefly at the end of the afternoon for a very few massed dances and a few show dances from the young stars of the Morris. There will also be an opportunity to get together later for music, singing and socialising. Each side is responsible for your own travel, accommodation and victualling so you manage all your own costs. 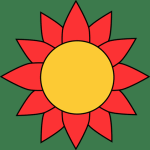 Information on B&Bs, hotels, hostels, campsites etc., on rail links, park+ride etc. and on pubs etc. will be provided later to every side registered to attend. 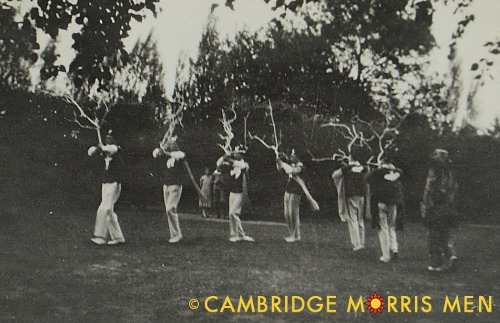 A page of the Cambridge MM website will soon be set up, dedicated to this day of dance and updated as more information is gathered. At the moment, we should like you just to register your intention to come to the event – please let us know by the end of February at the latest, so that Cambridge MM can make the final arrangements with full knowledge of the number and styles of teams attending. 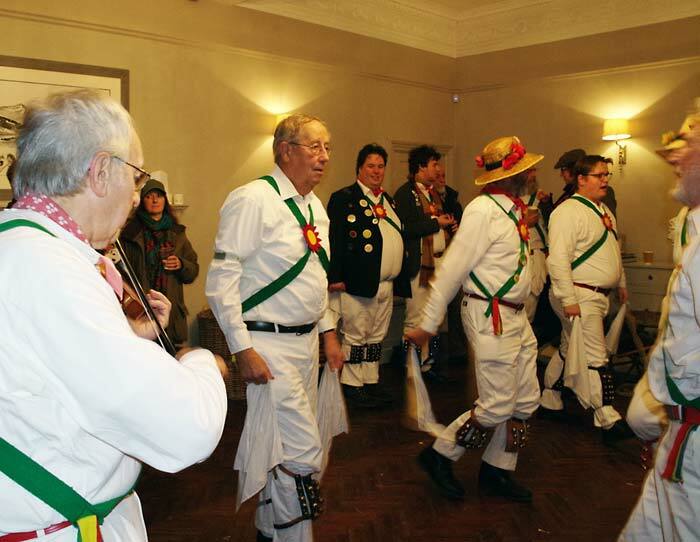 It is with much sadness we have to report the passing of Reggie Welbank, longstanding Cambridge Morris and Travelling Morrice Man and Musician. 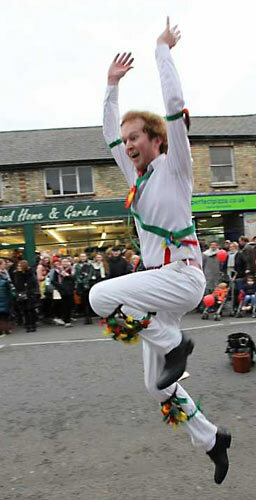 Come and try Morris Dancing! On Tuesday 1st October at 8.15 pm, there’s a taster session, free and open to all. Come along to the Arbury Community Centre on Campkin Road, CB4 2LD. This is your opportunity for a workout, improved coordination and a better life.